I love making and baking a variety of muffin recipes and today I thought I would share this great recipe with all of you from my great aunt. It's one of her favorite muffin recipes! In a large mixing bowl combine together the all-purpose flour, granulated sugar, baking powder and salt; set aside. In a large mixing bowl combine together the large egg, 1/2 cup of the lemonade concentrate, whole milk and vegetable oil. Mix with an electric mixer until ingredients are well blended. Pour the wet ingredients into the dry ingredients until well combined. It is okay for the batter to have small lumps in it. Preheat oven to 350 degrees F. Line a muffin tin with paper liners. Spoon the batter into each cup, filling them 3/4 of the way full. Bake in a preheated oven for 18-20 minutes or until they are done. Remove from oven and immediately brush the remaining lemonade concentrate across the top of each muffin (don't soak them). Let them cool. 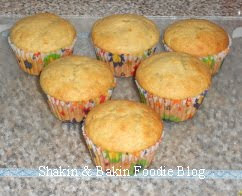 Store cooled muffins in an airtight container for up to 4 days.